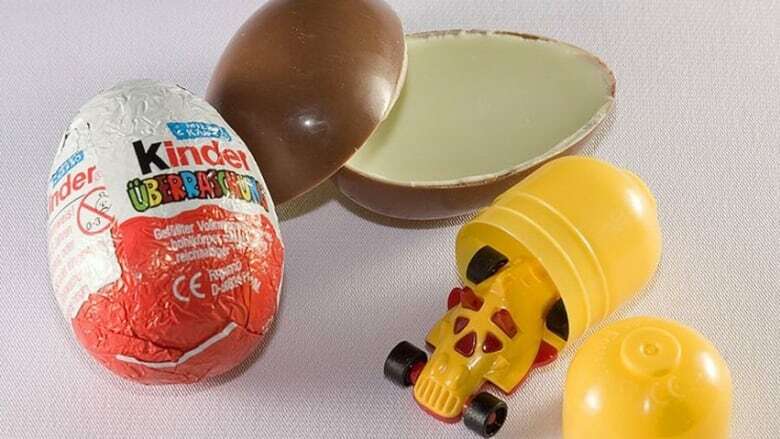 Three Canadian women are being held in a Seattle detention centre after an elaborate Kinder Egg smuggling ring was uncovered. Border officials have seized more than 6,000 chocolate eggs containing tiny toys such as a little plastic horse that is also a whistle. The Italian confectionary is popular in Canada but illegal in the US where small plastic items, like a wind-up, walking piece of cake or a raccoon playing the trumpet, are considered choking hazards. This has created a lucrative black market, a source of increasing tension between the Harper and Obama governments. A 500 ft. tunnel running from the outskirts of Abbotsford, B.C. to a shed in Sumas, WA was detected late last week by Dale Lawson while he was walking his dog: "Buster got into this weird looking shed," say Lawson, "he comes out with chocolate in his mouth." Lawson, worried that his dog could get sick, took the chocolate and found it contained a plastic capsule. "I thought maybe it was drugs but when I opened it up it was a little plastic fox dressed like a queen. I called the police right away." Police arrived just as Melanie Russet, Marg Spooner and Lynn Dodwell emerged from the tunnel with flats of chocolate eggs. The three were taken into custody and more arrests on both sides of the border are expected. It's estimated that up to 800,000 eggs cross the border every year and while there have yet to be any reported fatalities, it's only a matter of time before a child chokes on a tiny house with googly eyes or a pen shaped like a ski. Satire written by Kurt Smeaton.